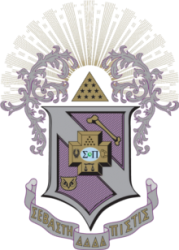 Sigma Pi Fraternity was founded in 1897 at Vincennes University, in Vincennes, Indiana. Our Executive Office is located at the historic Mitchell House in Lebanon, Tennessee. The Fraternity is one of the top men’s collegiate organizations in North America, with more than 120 active chapters and colonies in the United States and Canada. With over 100,000 alumni and 5,700 undergraduates; our men strive for excellence by living our core values to promote fellowship, develop character and leadership, advance heightened moral awareness, enable academic achievement, and inspire service. Sigma Pi is the only Greek letter organization with an international philanthropic program, The ACE Project, specifically designed to give back to our host institutions. ~Tony Romo - Quarterback of the Dallas Cowboys. ~Herman G. Fisher - Founder, Fisher-Price Toys. ~Tracy Lawrence - Country Music Star. ~H. Lawrence Fuller - Chief executive officer, Amoco Oil Company.~Hugh "Bones" Taylor - Redskins' all-time scoring and pass-receiving record holder. ~Guy "Red" Mackey - Legendary boilermaker football player, the namesake of Mackey Arena at Purdue University. Amazing Day Foundation: Goal is to reduce rate of suicide and emotional distress among college and university students.